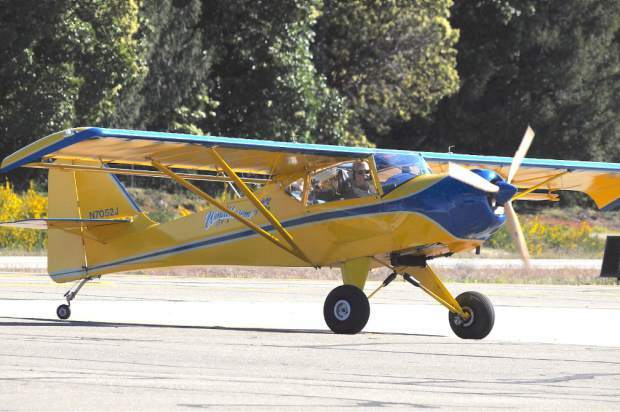 Wray Fleming of Cameron Park flew in the Nevada County Air Parkt in a KitFox plane Wednesday morning.The United Flying Octogenarians (UFO) flew to the airport for a social meeting, where they share stories about their flying. The national organization has around 1,500 members. Their membership requires that they fly at least once after their 80th birthday. 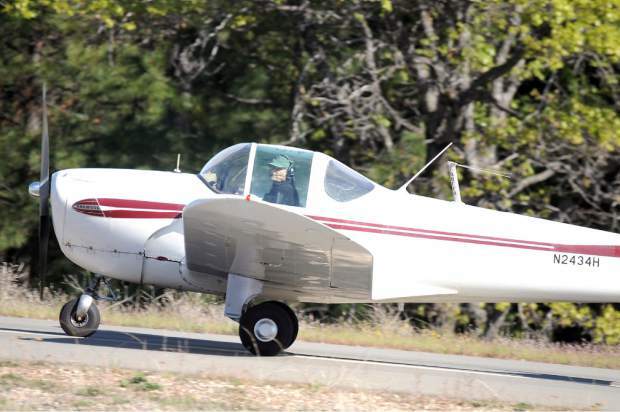 The United Flying Octogenarians (UFO) flew in the Nevada County Airport, Wednesday morning. The national organization has around 1,500 members. Their membership requires that they did fly at least once after their 80th birthday. 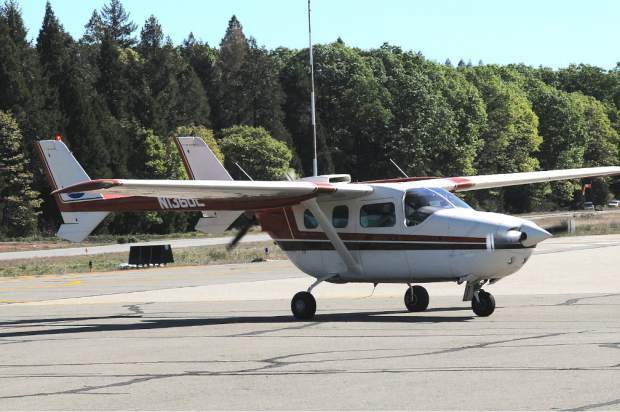 Orin and Jacque Koukol of Sacramento flew a 1978 Cessna Spymaster plane as part of the United Flying Octogenarians (UFO), to the Nevada County Air Park Wednesday morning. The national organization has around 1,500 members. Their membership requires that they did fly at least once after their 80th birthday. Warren Wood of Carmel Valley was among the United Flying Octogenarians (UFO) who flew in the Nevada County Air Park Wednesday morning. The national organization has around 1,500 members. Their membership requires that they did fly at least once after their 80th birthday. 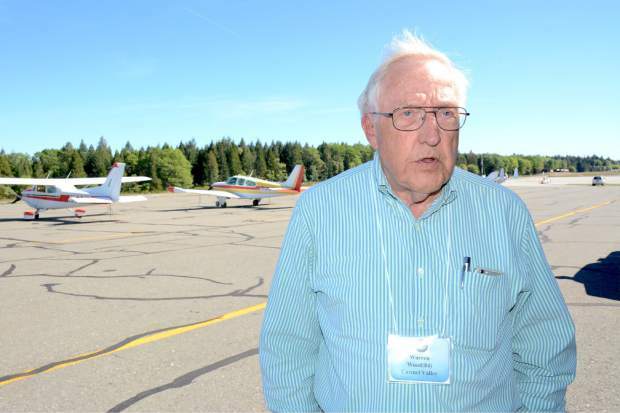 Frank Robinson of Healdsburg flew as a member of the United Flying Octogenarians (UFO) to the Nevada County Air Park. Wednesday morning. The national organization has around 1,500 members. Their membership requires that they did fly at least once after their 80th birthday. 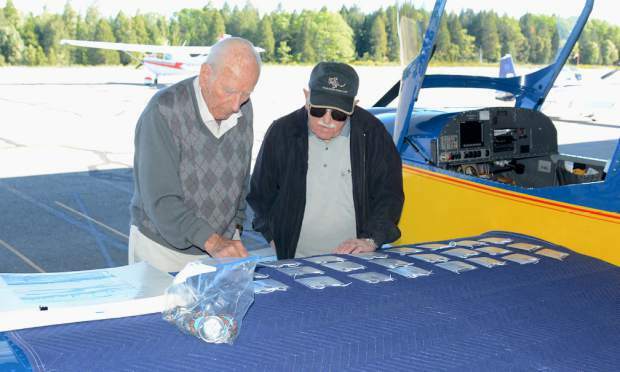 J. Perry Thomas, left, and Harold Wolfe of Grass Valley check name tags of the pilots of the United Flying Octogenarians (UFO) who flew in the Nevada County Air Park. Wednesday morning. The national organization has around 1,500 members. Their membership requires that they did fly at least once after their 80th birthday. Thomas, who will turn 99 this year, is a retired United Airlines captain. When most people turn 80 years old, the retirement home awaits — for others, however, it is the sky. 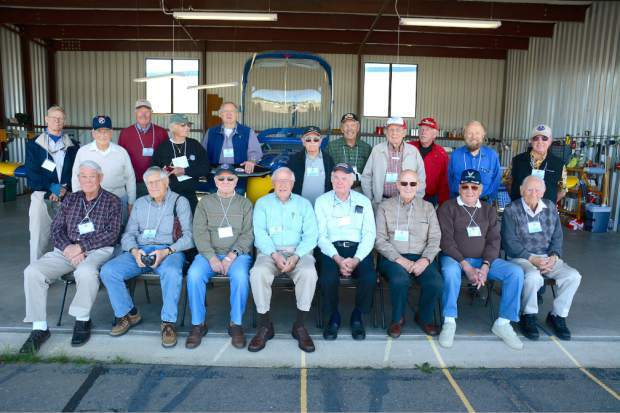 On Wednesday, a group of men and women gathered at the Nevada County Air Park, all having flown to Grass Valley in their various aircraft. This might not be remarkable except for the fact that each and every one of them was older than 80. The United Flying Octogenarians (UFO) is a group of pilots defying the conventional laws of aging by continuing to fly after their 80th birthday. In fact, making a flight after one turns 80 is the only requirement to join the group. UFO was started by 25 men in 1982, with the simple goal of having a group of older pilots with whom to share experiences. The group has grown substantially over the last few years, expanding from 600 members in 2007 to more than 1,400 as of 2015. Much of this growth is thanks to the president of UFO, Warren Wood. The difficulty of this feat is not lost on any of the members, who regard their experience with UFO fondly. “It’s been fun, just knowing there are other guys who like to do what I do,” said Don Fraser, a retired Marine Corps captain who joined UFO at the suggestion of a friend. The pilots all crowded about Harold Wolfe’s custom-built aircraft Wednesday and shared stories about exploits and adventures. Wolfe is the area director for Northeast California and is responsible for organizing the meeting. “As you might expect, there is some considerable lying that goes on,” Wood said of the pilots’ stories. Perry Thomas is one particularly extraordinary member of the group — when he celebrates his 99th birthday next month, he plans to do so by going up in an airplane and making a few landings. “Nothing too difficult,” said Thomas, who flew for United Airlines for 36 years and has logged over 22,000 hours of flying time in his life. He recalled the advent of the large jet airliners like the Boeing 747 in the 1960s, remarking with a smile on the increased speed, comfort and, most significantly, pay that these planes brought. All the pilots maintain that the group is purely social, a shared community of men and women defying age in the sky. “A way for a bunch of old pilots to hang out with one another and talk about flying and flying machines,” Wood said over the sound of an aircraft landing behind him. As the plane rolled in yet another member, each and every head immediately turned to behold it, the excitement of the moment clear in the eyes and smiles. “I got the bug when I was 18,” said Thomas. And as his gaze followed a plane taxiing in to the runway, it appears the bug is still very much there. Kael Newton is a Nevada Union High School graduate and University of Oregon student.